"Did you ever wonder what your work has to do with your faith? The short answer is everything, and now you can read all about it in the Theology of Work Bible Commentary, now in print for the first time. Heartily recommended." "The commentary provides unique and helpful theological and practical connections between the Bible and Christians’ working world." "We recommend this resource to you, and invite you to take a closer look." "Often when thinking of a Bible commentary, one considers a work that might be used in constructing a sermon or a lesson plan. One does not often consider a work that you would pick up and read from cover to cover. 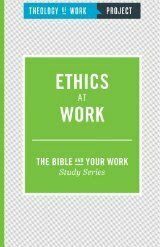 While still a commentary, because of its uniqueness in content, tone, and applicable nature, one might want to make an exception for the Theology of Work Bible Commentary. All five volumes of this work are available online at no cost, making this remarkable work not only available to those who want to purchase a print copy, but to those who are simply intrigued with greater empathy regarding how an understanding of Scripture can impact their day to day work. Overall, this work provides excellent insight into how Scripture can be applied to modern day work. 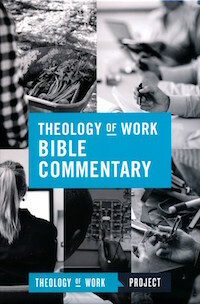 The inclusion of the word “commentary” in the title of the Theology of Work Bible Commentary should not deter businessmen or businesswomen from looking into this work to understand how God can be glorified through their day to day working. Nor should the practical nature of this work discourage the pastor or scholar from looking at this fresh insight to the applicability of God’s word in the modern day." "There is little doubt that this volume of The Theology of Work Bible Commentary could be a good resource for Bible studies, small group discussions, Sunday school classes, and similar contexts in which Christian life and vocation are the focus of study." ​"This guide is designed for Christians in the workplace interested in developing a Christian framework of ethical decision-making. One thing I like is the “less is more” approach that seems to me realistic to accomplish in a half hour discussion over a lunch break or before work. While written specifically for use with workplace groups, I also think this could be highly useful in adult education courses in churches and with Christian groups in business schools, particularly for those who have already had work experience."